As people start to wear their poppies with pride, in perhaps what seems a very apt time of year, I have recently finished Markus Zusak’s The Book Thief. This masterfully told story, documents the life of Liesel, a young adopted girl who lived just outside of Munich in a fictional town called Molching during the second world war.The main thread of the plot follows a turn of events which sees Liesel’s adopted parents, Rosa and Hans Hubermann take in a jewish man and hide him from the authorities and it is the relationships that develop between those living in the house that take a central role in the story, most notably Hans and his daughter, and Liesel and Max. In arguably its most defining characteristic, the novel is narrated by death. However a literary decision which could quite easily have felt gimmicky and a bit tacky in relation to the time in which the novel was set, was actually a stroke of genius by Zusak. Personifying death and in fact making him into a character that we feel empathy for and relate to only intensifies the way in which we view the horror of the actions of humanity during the second world war. Another thing I really loved is the scope that Zusak manages to cover with the novel. Perhaps somewhat naively, I had never fully considered what it would have been like to be a german during Hitler’s reign and the devastating conflict that millions of people must have felt knowing that his actions were wrong but being too terrified to do anything to stop it. This is brought to light by the variation of characters we come across even in Liesel’s small town, from the blindly following soldiers, to the helpless bystanders who feel powerless against Hitler. Zusak also focused on the power of words and language. 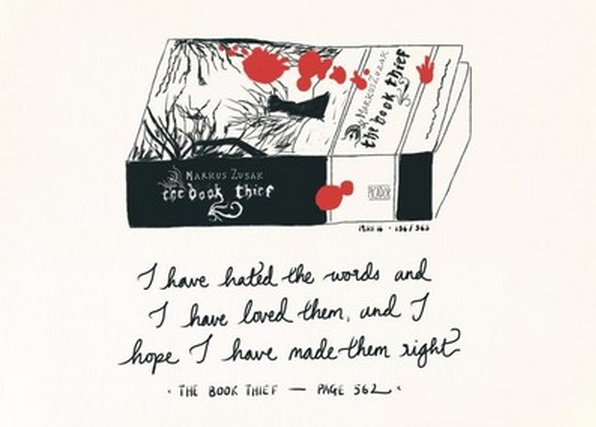 He illustrates how language can be used to poison the minds of people, as it was in much of the Nazi propaganda, however through Liesel’s fascination with books and Max’s short story “The Word Shaker”, he also shows how it can be a source of hope and a way to fight back. I think it might be the philosophical thinking in me, but it has always fascinated me how Hitler managed to insidiously push his way of thinking into enough people’s minds for him to carry out the atrocities that he did, but what this book highlighted to me was how much fear must have played a part in that. How many of the german people felt as horrified as we do now at what was happening but just felt paralysed to do anything about it? Just to warn you, I definitely wouldn’t call this book a page turner and the narrative is not the most easy to read as it is constantly broken by short bursts of death’s objective summation. Some of the events it depicts are inescapably unsettling and it’s not going to make you feel cheery! But for me, that is what gave the book its genius, because it laid bare the complete chaos and despair that was a key part of the german psyche at that time. Have you guys ever read any good war literature? I’d love to find some more good reads about this time.